This performing arts center has been bringing world-class entertainment to Schaumburg for almost 30 years. Find out what makes this a special regional destination. 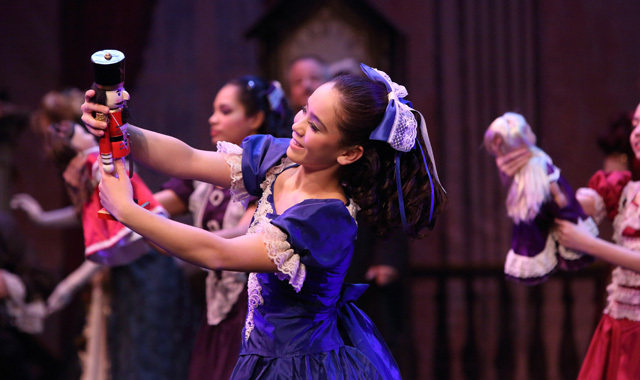 Schaumburg Dance Ensemble’s production of “The Nutcracker,” hosted annually at the Prairie Center for the Arts, has become a holiday family tradition. Bonnie Wagner has been attending events at the Prairie Center for the Arts in Schaumburg for the past eight years. It’s convenient: Wagner lives directly across the street from an arts venue that offers quality entertainment close to home. Wagner attends a variety of events throughout the year. She goes to an annual holiday concert, free outdoor summer concerts and a fundraising gala, where she won a silent auction package to be guest conductor for a night with the Schaumburg Youth Orchestra. The Prairie Center for the Arts, 201 Schaumburg Court, is owned and operated by the Village of Schaumburg. Opened in 1986, the Prairie Center has become one of the premiere performance venues in the northwest suburbs, hosting local entertainment as well as international touring acts in music, dance, theater and film. The auditorium is intimate, with just 442 seats – not a single one of which is farther than 15 rows from the stage. In addition, the Herb Aigner Gallery features the work of local, regional and international artists. Schaumburg was considered a sleepy town until the 1950s, when it was thrust onto the map. Thanks to the construction of O’Hare International Airport, the addition of the Northwest Tollway and the increased presence of a business workforce at the Pure Oil Company, Schaumburg became incorporated in 1956. At this same time, country singer Bob Atcher served as village president. During his tenure from 1959 to 1975, Woodfield Mall was built, and Schaumburg became a prime destination for businesses. Community leaders rallied to make that happen. The Prairie Center for the Arts opened in June 1986 and cost about $2.5 million, a majority of which was covered by developer donations. The original building was 16,000 square feet, which included a 442-seat theatre, outdoor stage, art gallery and meeting space. The Prairie Center expanded in 1997 to include a 100-seat lecture hall, more meeting space, additional restrooms, dressing rooms and a video production studio. Armistead has been instrumental in the center’s growth. She joined the village in 1985, when she was hired as the Prairie Center’s manager. Her role has expanded to oversee special events such as Septemberfest, Prairie Arts Festival, the town’s Christmas tree lighting, Volunteer of the Year program and the video production center. Armistead oversees the center’s day-to-day operations and its 19 full- and part-time staff members. The Prairie Center serves as the second home for the Elgin Symphony Orchestra, which presents four concerts at the Center each year. The space is also available for rent by organizations hosting theater productions, rehearsals, school concerts and plays, business workshops, seminars and meetings. Programming decisions start with the Schaumburg Cultural Commission, which was formed in 1980 to provide input on arts programming throughout the village. Over the years, the Prairie Center has welcomed entertainers such as Judy Collins, David Sedaris, Paula Poundstone, River North Dance Company, the Smothers Brothers, Penn and Teller, Crystal Gayle, Hubbard Street Dance, the Flying Karamazov Brothers and the Modern Jazz Quartet. In order to stay competitive with the market, the Prairie Center works to make ticket prices affordable. Most events cost anywhere from $10 to $35. The Prairie Center Arts Foundation was created in 1990 to help provide financial assistance to arts programming at the Prairie Center. The Foundation holds special events such as Celebrate the Arts, Come Wine With Me and Mystery at the Theatre. It also solicits individual memberships and corporate sponsors. The Foundation’s Arts Partners and Theatre Buddies programs raise funds for underserved populations to attend performances. In 2014, the Prairie Center hosted more than 800 events. “I count on one hand the days when there is nothing going on here,” says Armistead. “It’s always hopping.” About half of the patrons are Schaumburg residents; the other half come from Hoffman Estates, Hanover Park, Roselle, southern suburbs and downtown Chicago. The Schaumburg Youth Orchestra (SYO), a 15-member string ensemble, was created in 1989 at the urging of a local resident. Today, the program has 200 young musicians from age 10 through high school. All students audition and are placed in one of four levels based on playing ability. The SYO is a big deal; it’s been twice recognized as Illinois Youth Orchestra of the Year by the Illinois Council of Orchestras. Its founder and current conductor, Joe Malmquist, was also named conductor of the year. The SYO has toured in London, Paris, Germany, Japan and Italy. The Schaumburg Dance Ensemble premiered in 1995 to provide an additional performance opportunity for gifted young dancers. Each year, the Dance Ensemble presents an extravagant production of “The Nutcracker,” with more than 100 young people taking the stage alongside professional dancers from the Chicago area. The show has grown from 6 to 10 public performances, with three additional school performances. For nine years, the Prairie Center has been home to the Screen Test Student Festival, a public film festival dedicated to short film and video works by students in grades 5 through 12. During its ninth annual run this past April, the fest went international by showing works from Brazil, Norway, Iran and China, as well as works by area students. There’s more. The Summer Breeze Concert Series, co-sponsored by the Schaumburg Park District, features six free concerts on the outdoor stage, located on the grounds of the nearby Robert O. Atcher Municipal Center. More than 1,500 patrons attend each concert. The Prairie Arts Festival, created in 1988, is a juried art fair held on the grounds of the Schaumburg Municipal Center each Memorial Day weekend. More than 140 artists from across the Midwest take part in the event each year. This year, for its 30th anniversary season, the Prairie Center’s lineup features a wide range of music, dance, theater, comedy, film and family programs. Already this fall, the center has welcomed singer Richard Marx, Chicago’s Irish Heritage Singers, a tribute to Frankie Valli and the Four Seasons, legendary musical artist Rahis Bhari and the Bollywood Masala Orchestra, and a tribute to legends Hank Williams and Patsy Cline. In December, the Schaumburg Dance Ensemble hosts its 21st annual production of “The Nutcracker” during 10 performances from Dec. 4-13. The SYO and Youth Choir join forces to perform seasonal music in the “Presto! Holiday Concert” on Dec. 19. For a complete list of performances, visit prairiecenter.org. The venue is always looking for new programming ideas, says Armistead, who’s keenly aware of the factors for the center’s success. “We’ve been so lucky to have the support of the village president and board of trustees over the years,” she says. “It’s unique to have an arts center be part of local government. Without that support, the Prairie Center would have been a whole different venture. This entry was posted on Wednesday, November 25th, 2015 at 12:00 pm	and is filed under Arts & Entertainment, Top Posts. You can follow any responses to this entry through the RSS 2.0 feed. Both comments and pings are currently closed.